Simpson, C.T. 1896. The classification and geographical distribution of the pearly fresh-water mussels. Proceedings of the United States National Museum 18: 295-343. Simpson in Dall, 1896, Proc. U.S. Nat. Mus. : 5. Simpson, 1896, Proc. U.S. Nat. Mus. : 371, pl. 32, figs. 1-3. Simpson, 1900, Proc. U.S. Nat. Mus. : 711. Simpson, 1914, Descr. Cat. Naiades: 622. 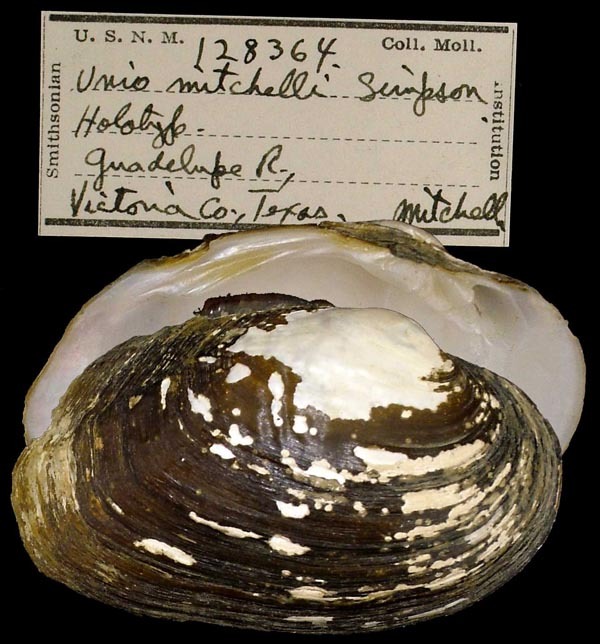 Type(s): LECTOTYPE USNM_128364 (selected by R.I. Johnson, 1975), Guadalupe R., Victoria Co., Texas. Lepidodesma aligerus (Heude). — Simpson (1896: 311). Lepidodesma languilati (Heude). — Simpson (1896: 311).